How Do The Hollywood Diet® Products Work? The Hollywood Diet® line of products is an excellent set of tools that can help make one’s lifestyle transition easier than ever before. But how does The Hollywood Diet® Work? Each product is a little different and can be used in multiple ways: as a quick “weekend” weight loss solution to help you fit into that wedding dress, as part of a regular diet plan to help you cut unnecessary calories out of your life, as part of a weekly cleansing routine to help you eliminate toxins, recharge your metabolism, and reinvigorate your ongoing weight loss efforts, or as a portion controlled caloric restriction meal alternative or supplement. The Hollywood 48-Hour Miracle Diet® is a scientifically proven way in which you can lose several pounds over the course of just a couple of days. It works by giving your body all of the nutrients it needs in the form of a delicious and nutritionally well-balanced juice drink. You can use this super-powered drink as a meal alternative (you are fasting) for two full days in order to cleanse your system of toxins, dramatically reduce your caloric intake, and help your body shed excess weight. 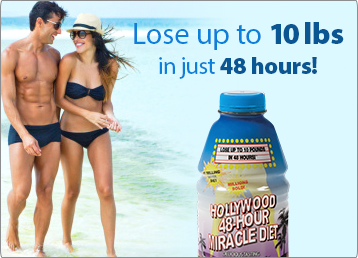 Hollywood 48-Hour Miracle Diet® fans have used this product to drop unwanted pounds before military weigh ins, shed inches to more easily fit into those “little black dresses”, jumpstart their ongoing diet regimen by losing pounds fast, or as a method of punching through those weight loss plateaus that all dieters hit. This product is wonderful for boosting morale and keeping your spirits up because you can literally see the results—pounds lost—in just days, not weeks. In a double-blind, placebo-based study participants lost between 2.0 and 13.2 pounds in just 48 hours. Similar to the 48-Hour product, the Hollywood 24-Hour Miracle Diet® was created to deliver the nutrition your body craves while weeding out unnecessary calories, unnatural sugars, and other refined ingredients. The most common way people make the Hollywood 24-Hour Miracle Diet® work for them is as a weekly boost to their restricted calorie diet. Indeed, The Hollywood 24-Hour Miracle Diet® is the perfect partner for those looking to try an alternate day fasting diet (commonly called a 5/2 diet). This method of dieting allows users to eat normally 5 days out of the week while fasting (limiting caloric intake) for the remaining two days. 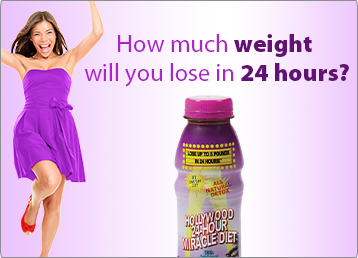 The Hollywood 24-Hour Miracle Diet® makes an excellent food substitute for those fasting days because all the nutrition you need is included without the added calories. This type of alternate fasting diet has been scientifically studied in America and abroad, and has been proven to show radical results. It works by resetting your own metabolism and “tricking” your body into burning the fat stored in your body, preventing sugars already in your blood stream from turning into fat. The Hollywood Cookie Diet® works by replacing two meals per day (typically breakfast and lunch) with up to four (4) great tasting cookies and allowing you to eat a sensible dinner (up to 900 calories). You can use this method every day! And users have reported great success because the cookies satisfy your appetite with low caloric intake. The delicious tasting cookies are individually wrapped to assist with portion control. 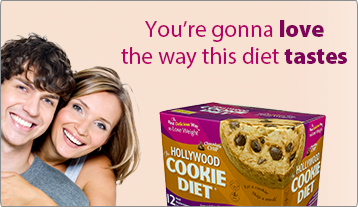 Most Hollywood Cookie Diet® fans use these meal replacement cookies daily as an ongoing supplement for a low calorie diet. Typically these folks are the ones who are committed to losing weight over a longer period of time rather than those looking to fit into a dress for that Saturday night soiree. Some even supercharge their weight loss by working in The Hollywood 48-Hour Miracle Diet® or The Hollywood 24-Hour Miracle Diet® on occasion to bust through plateaus. Indeed, during one scientific study participants lost an average of 7 pounds in just two weeks (with some losing up to 11 pounds) by eating Hollywood Cookie Diet® cookies while consuming a sensible 900 calorie dinner. But what’s more important, every single participant loved the taste of the cookies and wanted to use the diet again when the study was over. The key to ongoing weight loss is sticking with a diet. You’re not going to do that if you feel deprived or feel like the diet is more work than it’s worth. That’s why The Hollywood Diet® Store has created weeks’ worth of sensible and sensational recipes to help you stay on track. From Maple Glazed Salmon and Minted Couscous to stick-to-your-ribs Mashed Potatoes (yes, you read that correctly, mashed potatoes) you’ll find everything you need to get your diet off on the right foot.